The ranching business, like life, entails tradeoffs, and the law of diminishing returns always applies. Fertility, pregnancy rates and calving rates for example, can make or break ranch revenue, but at some point, the inputs required to move calving rates a few percentage points higher can eat up your profits. Ranchers then face a challenge of finding that “sweet spot” in their reproductive strategies, optimizing fertility and calving rates based on costs and limitations within their production environments. Assuming cows or heifers are free of disease, injury or genetic factors that limit fertility, nutritional status probably plays the biggest role in managing the reproductive cycle and calving rates. Oklahoma State University animal scientist Glenn Selk, PhD, reminds producer that body condition at the time of calving is the most important factor affecting rebreeding performance. Also though, changes in body condition from calving through breeding plays a big role in rebreeding success. This, he says, appears most important to those cows that calve in the marginal body condition score range of BCS 4 to 5. Compounding the issue in spring-calving herds, cow diets during spring often fall short on energy requirements. In an Oklahoma trial, researchers sorted two groups of cows, which began the winter feeding period and calved in similar body condition. After calving and before the breeding season began, one group was allowed to lose almost one full condition score. The other group of cows was fed adequately to maintain the body condition they had prior to calving. In this trial, the group that maintained body condition calved at a rate of 94%, compared with just 73% for the group that lost body condition. Supplemental feeding can help maintain cow body during the post-calving period, but becomes cost-prohibitive at some point, and genetic selection remains a key tool in developing females adapted to the production environment. Rancher and researcher George Seidel, PhD, stresses that cows need to fit the production environment for optimum reproductive efficiency. Seidel is a university distinguished professor in reproductive physiology at Colorado State University. He also runs a seedstock and cow-calf operation, Rabbit Creek Angus Ranch, near Livermore, Colorado. He often conducts trials and tests reproductive strategies in his own herd. Seidel endorses the concept of “stressing the system” somewhat to help select well-adapted replacement heifers. Select and breed more heifers than you need for replacements, keep those that become pregnant with one or two breedings and sell the open heifers. A key goal should be to maximize the number of heifers calving in the first 21 days of the calving season. Those are most likely to re-breed early enough to deliver a second calf 12 months after the first and stay on schedule through their lives. Milk is a key EPD for addressing that goal. High-milk females have high maintenance requirements, and are most likely to lose body condition during lactation. Seidel uses artificial insemination with heifers and cows, and prefers to use Ovsynch protocols, which enable AI to be performed at the optimum time with or without estrus detection. Ovsynch increases the service rate in a herd of cows, with all of the cows subjected to the protocol inseminated on the same schedule. Seidel says Ovsynch protocols get cows and heifers cycling earlier, setting them up for conception at first or second breeding. Many producers, he says, have seen benefits to synchronizing females even in natural-breeding systems, using either CIDRs (Controlled Internal Drug Release) or feeding melangestrol acetate (MGA) prior to bull turnout. In his ranch tests, Seidel also has seen good results from using Estrotect heat detection patches to determine which cows are cycling without using a CIDR (Controlled Internal Drug Release) for estrus synchronization. This saves expenses and complexity in his breeding program. Heifers, Seidel says, tend to be very fertile if bred based on heat detection, but are more difficult than cows to synchronize using an Ovsynch program. Cow-calf producers tend to use AI more in heifers than in cows, as a means of continuous genetic improvement, ability to use calving-ease sires and fewer management issues than required to synchronize and breed cows with calves at their sides. Seidel notes an inherent tradeoff between phenotype and genotype in beef herds. “If the youngest females in the herd do not carry the best genetics in the herd,” he says, “you ae moving backward.” So it makes sense to focus on replacement heifers for upgrading herd genetics. Heifers, however, tend to be the least productive females, producing lighter calves and presenting challenges for rebreeding. Ranchers need to find a balance between the number of young females with the greatest genetic potential and older cows with proven productivity. In a recent Applied Reproductive Strategies in Beef Cattle workshop, University of Missouri Animal Scientist Dave Patterson outlined some basic considerations for synchronizing cows and heifers. He says synchronization in cows works best when they have minimum body condition scores of 5 and are at least 50 days postpartum at the time of breeding. Multiple synchronization protocols offer ranchers options based on their production environments, facilities, labor and personal preferences. Some of these rely on heat detection while fixed-time AI (FTAI) protocols involve insemination of all females at a predetermined time. Heifer protocols include options using orally dosed (MGA) or CIDR devices, which halts estrus until withdrawn, with prostaglandin administered to induce estrus. Patterson notes that success with oral MGA protocol depends on heifers consuming the correct dosage. 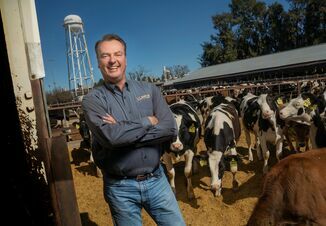 Remote monitoring systems, which can predict heat, warn caretakers when calving is imminent and detect health issues, have could become common in dairies and will gain traction in beef production as costs drop. Allflex, for example, recently introduced its SenseHub Beef system, using specialized ear tags to monitor cow activity, detect when cows come into estrus and list which are ready to breed. Timely breeding, as mentioned earlier, helps increase conception rates in that first cycle. The system electronically generates reports telling you which cows are in heat, so you will know later if a few cycle back and need to be bred again. Crossbreeding remains a key tool for cow-calf producers seeking to improve fertility and overall productivity. Using composite bulls can simplify crossbreeding systems and maintain a high level of heterosis across the herd. Producers face tradeoffs in genetic selection though, between bulls weighted toward maternal or terminal traits. 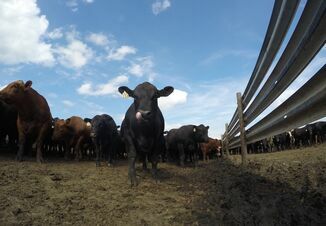 Seedstock breeder Lee Leachman, at Leachman Cattle of Colorado encourages producers to use maternal crosses on part of the herd, typically heifers or younger cows, to produce the next crop of replacements. 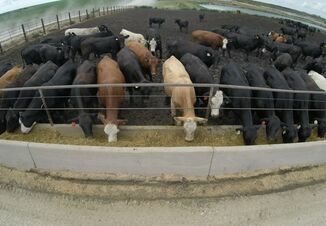 Then use a terminal-cross bull with older cows to produce feeder cattle. This requires the rancher to keep close track of parentage. Options include maintaining separate maternal and terminal herds, genomic testing for parenthood confirmation, or Leachman says, use Charolais bulls to simplify identification of terminal-cross calves. Bulls from other breeds can provide similar terminal EPDs, but using a Charolais bull allows easy identification of smoky calves for the feedlot. The Beef Reproduction Task Force, made up of specialists from several cooperating universities, holds annual conferences and maintains the Applied Reproductive Strategies in Beef Cattle website, hosted by the University of Nebraska. The website includes a wealth of resources including 2019 recommended synchronization protocols for cows and heifers, the AI Cowculator, conference proceedings and more. Find it at https://beefrepro.unl.edu.